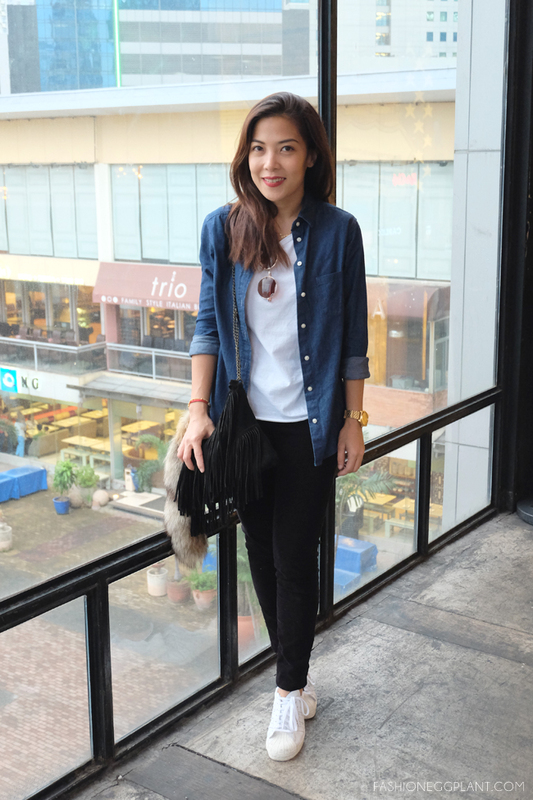 This is what I wore to the Wrangler True Wanderer launch last week. It was raining and I wasn't really in the mood to dress up so here... :P haha! Hope it still "inspires" you. Bright red touches via lipstick and a bracelet + a loud fringe bag with a fox tail attached! It's an old favorite that I always tend to go back to during the summer. So that's one thing to remember: bright red lipstick! See? 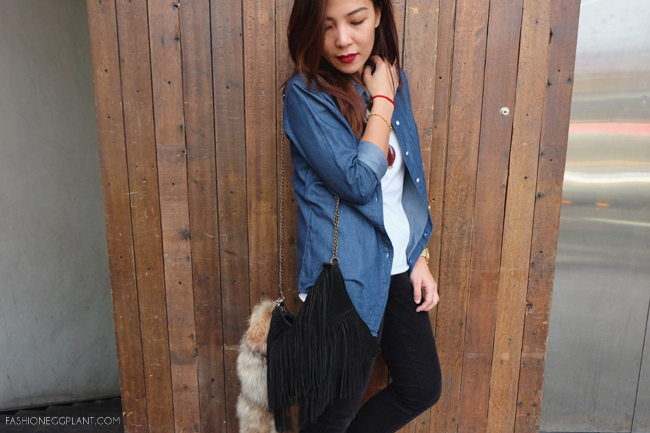 The red + fringe and fur add zing and zhush. :P Hahaha! The Vaseline Seize The Summer contest is ending soon and Team Yup would really appreciate your help by posting your photos online! Just follow the instructions in the poster above. + You also get a chance to win an all-expense paid trip for 2 and Vaseline water-based serum giftpacks daily! ***for an easy way to gain LOTS of entries, just search the hashtag: #TeamYup on twitter and QUOTE TWEET RETWEET as many entries as you can! Simple retweets won't count. Thank you and good luck! what is the meaning of Quote Tweet retweet Sarah? Gosh! I so love that black fringe bag. Where did you get yours? I've been looking for that for quite sometime. 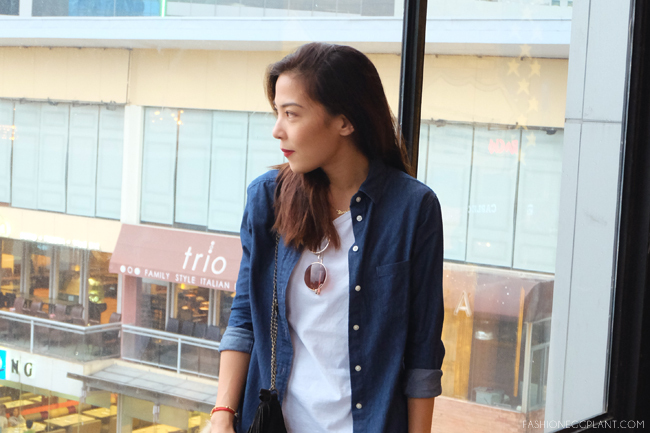 you look chic, simple and not tomboy, even if the fashion inspiration is obviously the tomboy look :) love the red lips! I know what you mean!!! I got shocked myself just a few weeks back when I realized my daughter is closer to 20 than I am... kase feeling ko 28 pa din ako. hahaha! But I love this look on you. I might even buy one for myself. Perfect to show the shoulders, and hide the less than perfect arms. I love red lippies too! :) They could instantly glam you up. nakaka cryyyy! im not ready hhahaha, i really feel like peter pan - patricia pan. I totally agree with the red lipstick as a total outfit fix!!! When I feel drabby, I just put on that red lipstick and I'm ready to go! I also joined the contest! Thanks for that! :) Super fun! You look so young with the outfit. Looks really comfortable! Ooohh!! I love the touches of red! Very stylish yet comfy ensemble! Love your blog! I've been a lurker for awhile now, first time to comment. Very nice relaxed look! I don't use lipstick, much more red lipstick but I'm gonna give it a try. Thanks for the tip Sarah! It looks great that way although I'm pretty sure it will look nice too when tucked in. I need to buy some summer clothes. Must check out Zalora now!